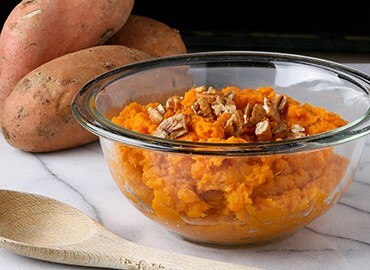 Prick the sweet potato 8 to10 times with a fork on the outside skin. Microwave for 7 to 8 minutes. Take out and let sit 3 to 4 minutes. Be careful as it is hot. Take a knife and cut the sweet potato in half. Scoop out the flesh onto a plate or into a bowl. Top with butter and cinnamon and mash together. Mixture will naturally be soft and smooth. Top with a few chopped pecans to serve.